We had 6 baby goats born in 2017. This is Mahogany. 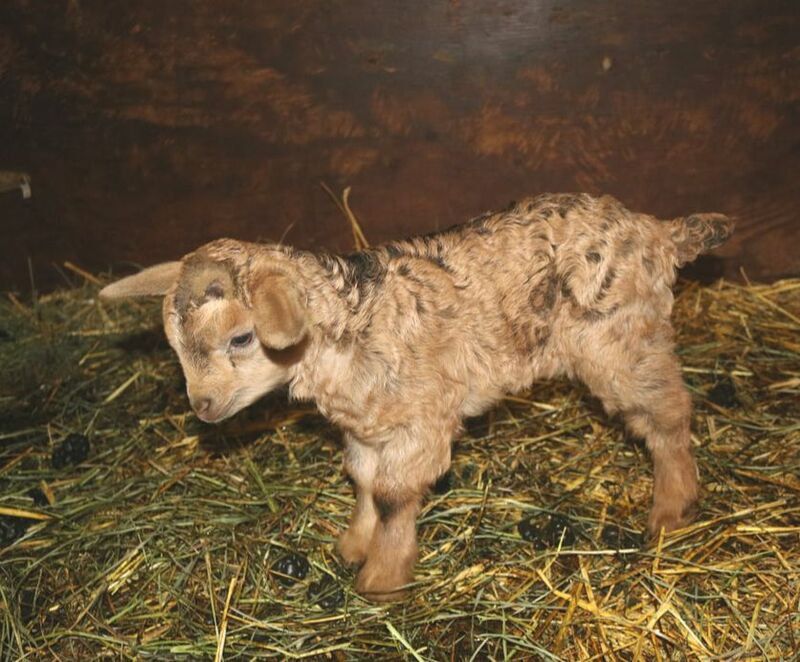 She is a doeling born March 21, 2017. Her parents are TVF Ostara and TVF Obsidian. She has beautiful coverage and a B type fleece. This is Double Stuff. He is a wether. He was born March 21, 2017. His parents are TVF Ostara and TVF Obsidian. He has fantastic coverage even his forehead will be covered. His fleece appears to be a B type. He is super friendly and will be a great goat for addition to your herd. This is Tesana. Her Dam is TVF Cammi and her sire is TVF Skittles. She was born March 23, 2017. She is super friendly and likes to come up for pets. This Buckling is Guinness. He was born March 23, 2017. His dam is TVF Cammi and his sire is TVF Skittles. He has great potential as a buck. He has a good strong body and nice fiber. This is Ariana. Her Dam is TVF Ophelia and her sire is TVF Merah. She was born May 22, 2017. She is super friendly and likes to come up for pets. This wether is Marcus. His dam is TVF Ophelia and his sire is TVF Merah. He was born May 22, 2017. He is very friendly. He has beautiful fiber. TVF Titania - Senior Doe - won First Place - Champion Senior Doe, Judge's Choice. Comments: Wonderful Fleece; very fluffy, warm handle; very fine, not a lot of crimp and curl; almost matte finish; B/C type if that still existed. TVF Oberon - Senior Wether - won First Place - Champion Senior Wether, Grand Champion Wether. 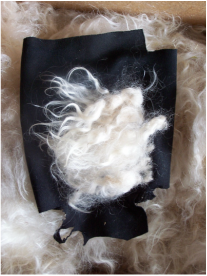 Comments: well arranged locks; fluffy, warm; good, yield for B type; separating not quite a good as other fleeces in show; guard hairs similar diameter to good fleece; little crimp and curl; good length; very fine; bit of sheen in light; mostly matte finish; leans toward B/C type. TVF Obsidian - Jr. Buck (6 mo. and younger) - won First Place - Champion Buck, Reserve Grand Champion Buck. Comments: Good conformation from the picture. Fiber is very clean; bit of sheen; good lock length; crimp and curl only on end; matte finish; fairly short; good example of C type; good separation. TVF Pez won 2nd place in the Senior Wether class. TVF Obsidian - Jr. Buck (6 mo. and younger) - won First Place - Champion Jr. Buck and he went into the Diamond Ring of all the goat breeds. 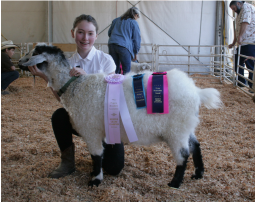 Sr. Wether Class: TVF Paddy - placed 2nd in the 3-4 yr. category and Hawks Mt. Ranch Oreoh placed 4th and TVF Pez placed 5th in the 4 yr. and older class. TVF Lacy placed 4th in the Jr. Doe (0-6 mo.) class. TVF Lina placed 2nd Place in the Senior Doe over 4 years category. 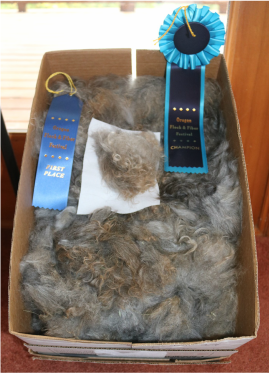 Her Fiber got Grand Champion Fleece (see below). Lina continues to do well. 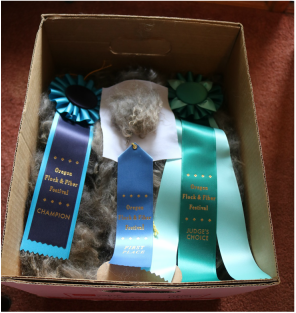 HMR Oreoh won First Place Senior Wether and went on to get Champion Sr. Wether and then Reserve Grand Champion Wether at the 2014 Oregon Flock and Fiber Festival. Holly Lawrence showed him. TVF Ostara won Third Place in Jr. Doe (12-24 mo. of age never freshened) category. TVF Nutmeg won Third Place in Sr. Doe (2-4 yr. of age). 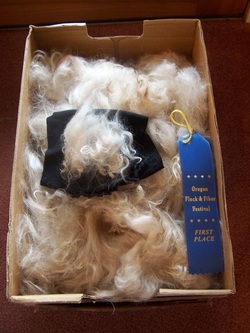 Her Fiber won Second Place in the Sr. Doe Fleece category (see below). TVF Cream Puff placed first and TVF Lina placed second in the Senior Doe Category (ages 4 yrs and over). TVF Pez wins Reserve Grand Champion. TVF Puk won 2nd Place and Reserve Champion Jr. Wether. TVF Pez won First Place and Reserve Champion Sr. Wether and then went off to win the Reserve Grand Champion Wether in the 2013 OFFF Pygora Show. TVF Merah was the Fifth place for Senior Bucks and TVF Othello placed Sixth. TVF Ostara was Sixth in Junior Does (0-12 mo.). TVF Pez won Grand Champion Wether in the Washington County Fair Open Show. And TVF Oberon won Reserve Champion Wether. 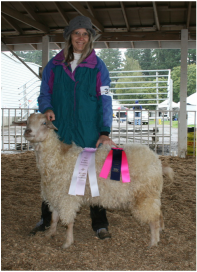 In 2010, TVF Lina won Best of Show in the Washington County Fair Open Show. Mountain Home Pygora's Romano won Grand Champion Wether at the Washington County Fair in 2008. TVF Lina - First Place - Class Senior Doe (over 4 years) Champion Sr. Doe and Reserve Grand Champion of whole show; Fleece Type: B, 7 oz. ; 5 yrs.6 mo. 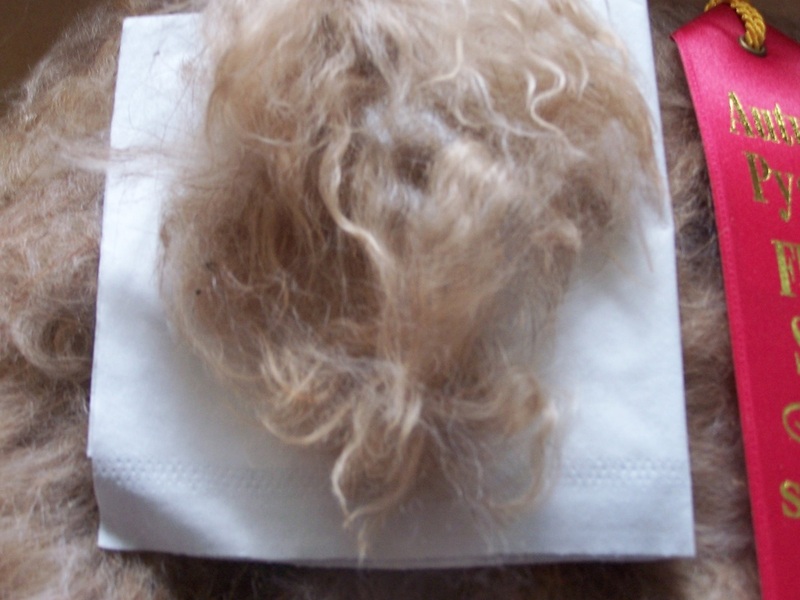 when sheared ; Comments: Type B; soft, very pretty, very fine; very clean; very typical Type B; very little guard hairs; Gorgeous; has spring, strong fiber. 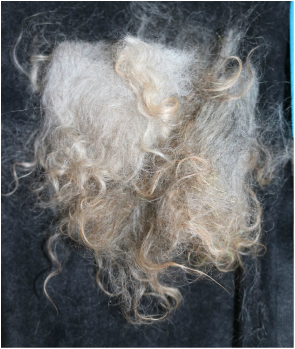 TVF Titania - Second Place Senior Doe (over 4 years) - Fleece Type: B; Comments: Type B; beautiful silver fleece, needs more skirting; very Type B characteristics; has guard hairs; no matting; all usable and sheared at a good time; hardly any vegetation; super fine; great for this old lady. TVF Pez - First Place Senior Wether (over 4 yr.) - Fleece Type: B; wt. 1 lb. 12 oz. Comments: Pretty, very clean; Type B lock formation; has spring, strong fiber. He was 5 yr. 6 mo. 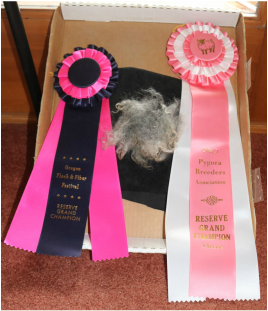 TVF Lina's Fleece Wins Reserve Grand Champion in the 2015 Autumn Pygora Fleece Show. 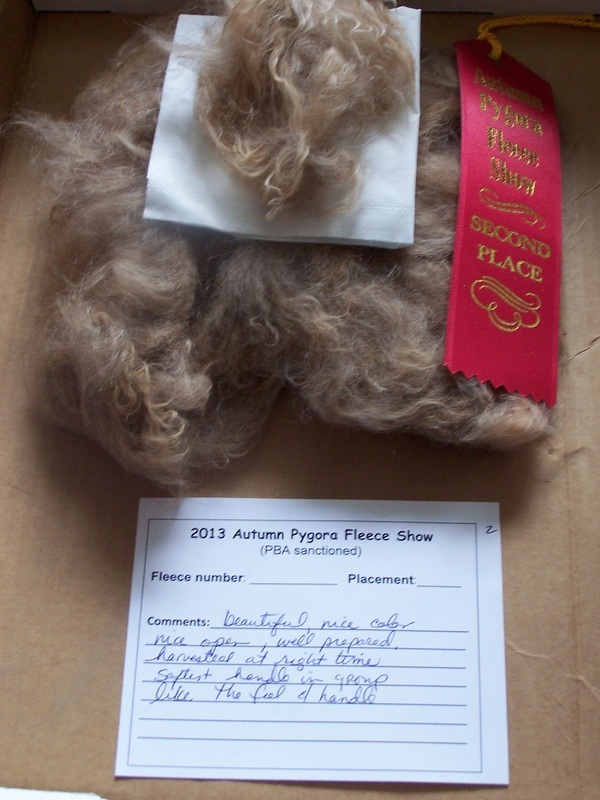 TVF Pez's Fleece wins First Place in the Senior Wether category in the 2015 Autumn Pygora Fleece Show. 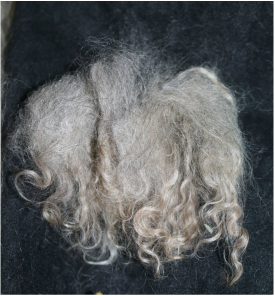 TVF Titania won 2nd place in the Senior Doe (over 4 yr.) category in the 2015 Autumn Pygora Fleece Show. She is 10 years old. Comments: Type B; soft, very pretty, very fine, very clean, very typical Type B; very little guard hairs; Gorgeous has spring, strong fiber. Comments: Pretty, very clean; Type B lock formation; has spring, strong fiber. Comments: Type B; beautiful silver fleece, needs more skirting; very Type B characteristics; has guard hairs; no matting; all usable and sheared at a good time; hardly any vegetation; super fine; great for this old lady. TVF Cream Puff - First Place in Doe Senior (over 4 yrs.) 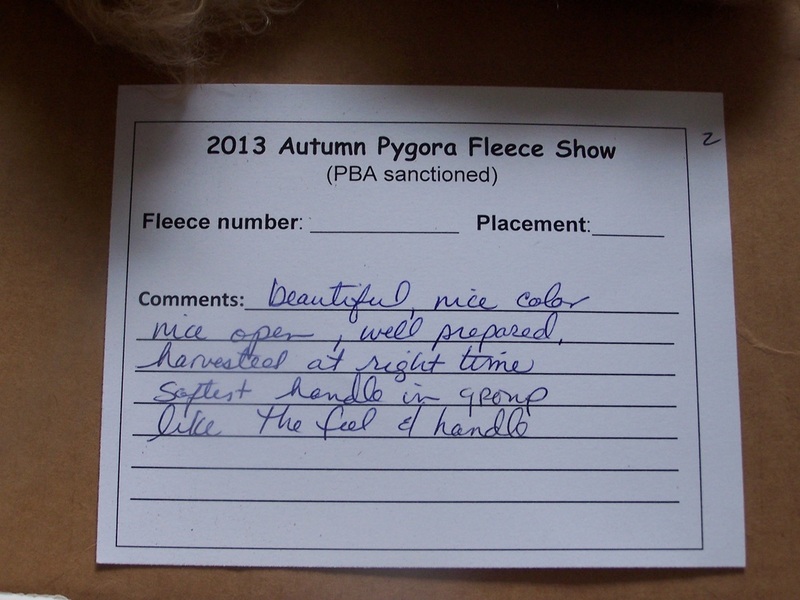 Class- Champion - Grand Champion Fleece; Comments: has wonderful fleece. 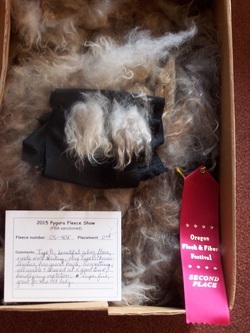 She got Grand Champion Fleece at Oregon Flock and Fiber Festival in 2014. TVF Nutmeg - Second Place in Doe Class (2-4 yrs. old); Fleece Type: B; Comments: Very fine. Gorgeous. Maybe skirt out the dorsal next time. This fleece has nice curl. TVF Nutmeg won Second Place in Senior Doe (2-4 yrs.) Class. Comments: Very fine. Gorgeous. Maybe skirt out the dorsal next time. This fleece has nice curl. TVF Merah (3.5 yrs) - 2nd place - Class Senior Bucks (2-4 years of age); 9 oz. 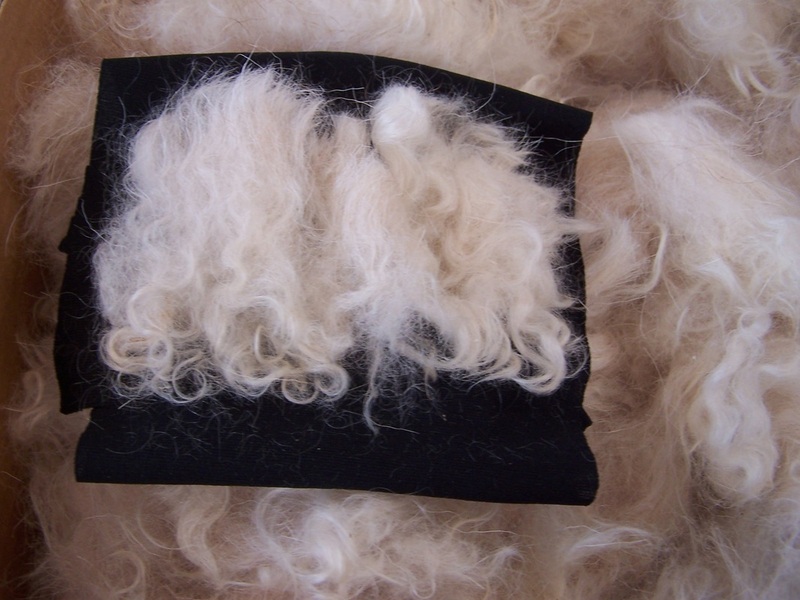 of Fiber; Type Fleece: B; Comments: Beautiful, nice color, nice open, well prepared. Harvested at right time. Softest handle in group, like the feel and handle. Mountain Home Pygoras Romano (9 yr. 11 mo.) 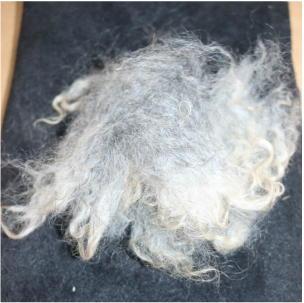 - Third Place - Class Senior Wether (over 2 years); Fleece Type: White B; 1 lb. 9oz. ; Comments: Typical B type, very well prepared clean like the handle better than one next to it. TVF Cream Puff (8 yr. 4 mo.) - 4th Place -Senior Doe (over 4 yrs.) 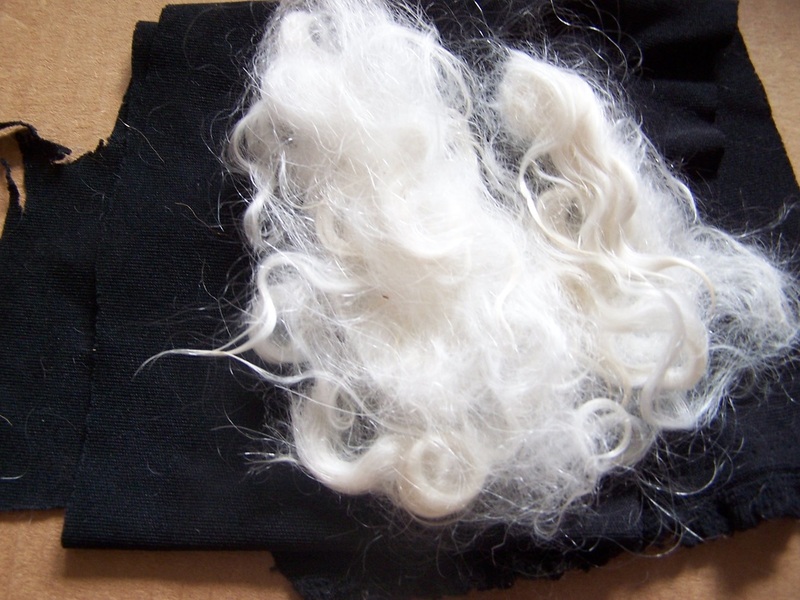 - Type Fleece: White B 12 oz. ; Comments: very nice handle, like the handle, very clean. TVF Merah won Second Place in Senior Buck (2-4 yrs.) Class. Mountain Home Pygoras Romano won Third place in the Senior Wether Class. Comments: Beautiful, nice color, nice open, well prepared. Harvested at right time. Softest handle in group, like the feel and handle. Comments: Typical B Type, very well prepared, clean, like the handle better than the next one. TVF Merah won First Place in the Junior Buck category. TVF Cream Puff won 4th Place in the Doe Yearling (1-2 old) category.